The Sunny is an affordable choice for people looking for spacious sedans. It fits anyone and everyone who is in the market for a low-priced spacious and reliable family car. 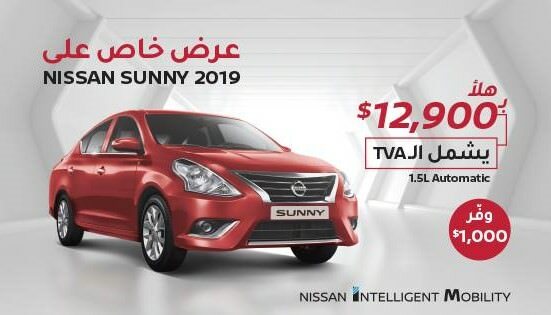 The Sunny 2019 is your ultimate family car with great safety features. * This offer is not available anymore. No. VAT is included, registration is not. Yes, the total saving is $700 compared to the previous price of $14,900. The Sunny is made to be an affordable family car. Its price of $14,200 and the brand name are two of the main reasons of its success. The SL (full option) version of this car costs an extra $3,000. Now the additional features are quite nice, but we invite you to also explore what other cars you can get with this budget.